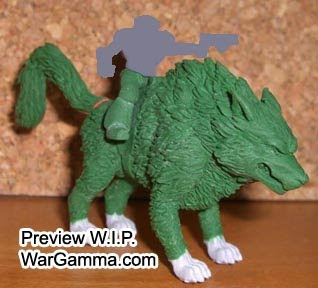 You Magnificent Bastards: Thunderwolf Cavalry modeling options? 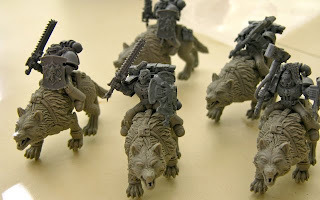 After sifting through conversion threads, new models popping up online, and arguing on Bolter and Chainsword over "counts-as" Thunderwolf Cavalry options, this is what I feel like my options for modeling Thunderwolf Cavalry are. I've graded them on how much I like the ideas, but please, put in your input or even link to what you've done. 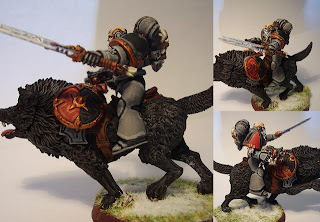 I specifically do not like the idea of "counts-as" suped up bikes, or 4 Wulfen on a 60mm base, or 2 Fenrisian Wolves leading a Grey Hunter or whatever on a 60mm base. Those aren't giant beasts, they aren't cavalry, and I don't think they warrant the stats of the TWC. 1. Russian Sculpts from EBay. Very nice model, but static. Only one pose. Resin. Probability: high. 2. High Elf Lion Chariot lions. Serious conversion and green stuff work. Probability: low. 3. Circle of Orbos wolves from Warmachine (I think). Cool models, I've seen them in person. They come in 3 poses, but seem just a little small. Probability: moderate. 4. IamJacks over at 40k Fight Club has some nice conversions using Juggernauts. I like them, but I think I'd rather them be more wolf-like. Probability: moderate. 5. New sculpts that are being released this weekend. 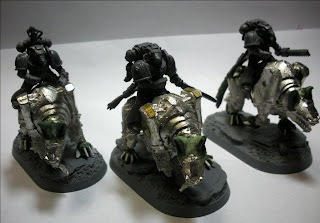 More resin, and they seem to be just about the size of Canis and Fangir, maybe a little smaller. There are 5 poses (the other 4 are being finished this weekend I've been told). Probability: very high. So what do you think? I like the Russian EBay sculpts, but I am leaning towards the last choice. I think the decision will be made if the other 4 are good looking. You don't want to use Juggernauts. They are RIDICULOUSLY expensive. They make me cry. I've seen a other Thunderwolf alt sculpts make their way through my Reader. I'll see if I can dig them up. That said, I think the last option you posted is easily the best. The least ones I listed are $90 for all 5 wolves too. I think we've got it all wrong so far. How can you justify a 3+ save on these enormous wolves when they have next to no armour. I think someone needs to go watch He-Man and look at how much armour Battle Cat had on him. That's what Thunderwolves need to look like! That's what I'm gonna try. I think the giant, tough wolf combined with cybernetic implants, and the fact that the marine already has a 3+ save warrants it. Plus they have SOME armor plates, even if it is very few. VC Direwolves can stand-in quite nicely with some GS work. 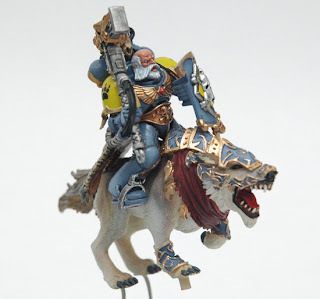 Well Rhellion, just wait and see what I cook up over at the Space Wolves blog.